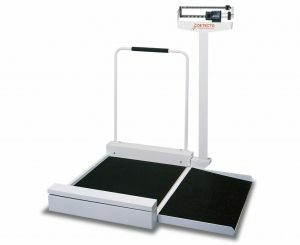 This mechanical wheelchair scale provides the cost-effective answer to weighing of patients in wheelchairs. Quality is enhanced by a precision die-cast weigh beam which is easily read from either side. The weight beam is located at a height above the platform where a patient or attendant can easily perform the weighing operation.